Quik Tea's Assorted Chai Teas feature all natural, Non-GMO ingredients and are the perfect treat for anyone who wants to sample a wide range of our handmade, artisan teas. Enjoy a a wide range of some of our most popular tea flavors, packaged either as an assortment of chai lattes in various flavors, or individually. Our delicious teas are sure to satisfy your taste buds and appeal to the various tastes of everyone in your family or office! Masala Chai Latte has been cherished for centuries in India and can help to aid weight loss, prevent water retention & is loaded with antioxidants, which fights free radicals. Cardamom Chai Latte - Cardamom is know to boost metabolism, elevates mood, fights free radicals and increases blood circulation for healthy skin. It is also known to boost immunity & improve digestive health. Ginger Chai Latte - Ginger has high levels of Vitamin C, magnesium and other minerals, ginger root is extremely beneficial for health, is known to boost the immune system & is great for digestion. Lemongrass Chai Latte - Lemongrass helps control cholesterol, cleanse & detoxify the body and is said to help lessen symptoms of depression, anxiety & insomnia. Nothing soothes, clams and comforts you like a nice cup of creamy chai tea. At Quik Tea we offer a variety of flavors that are sure to satisfy your taste buds with natural ingredients that support a healthy lifestyle. The list of benefits contained in each of these teas are endless, making any of these selections the perfect treat for your taste buds and your health! Get your variety pack today for yourself or a friend and enjoy the soothing and wholesome goodness of Quik Tea Chai Latte! BOOST HEALTH: Improve your health & wellness! All of our tea flavors are packed with nutrient rich ingredients that are as good for your health as they are delicious and comforting. CHOOSE FROM DIFFERENT FLAVORS: Quik Tea offers a wide selection of teas that are sure to be a hit with family, friends and co-workers. There is a flavor to suit everyone's taste, mood & craving. 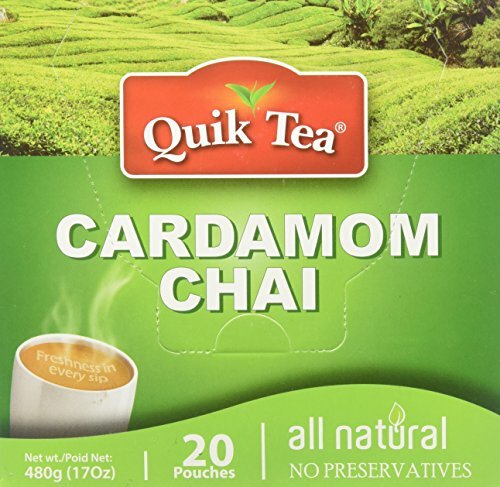 ALL NATURAL: At QuikTea we pride ourselves on producing teas that contain no preservatives and are all-natural so you can enjoy the health benefits of our teas the way nature intended. COFFEE ALTERNATIVE: Kick your coffee habit! Our teas help to elevate the mood & satisfy your craving when you're running on empty. Enjoy a tasty treat while sticking to your health goals. If you have any questions about this product by Quik Tea, contact us by completing and submitting the form below. If you are looking for a specif part number, please include it with your message.